Kastar Brake Resetting Gauge services foreign and domestic cars and light trucks with drum brakes. The Kastar Brake Resetting Gauge features a wide working range that allows measurements from 6-1/2 to 13-1/4 in diameter, and can lock the measurement at the appropriate inch or metric calibration during use. Kastar's heat-treated, chrome-plated steel jaws ensure long tool life. The 380A Kastar Brake Resetting Gauge is one of thousands of quality tooling products available from MRO Tools. Please browse Kastar Brake and Wheel Tools for tools similar to the 380A Kastar Brake Resetting Gauge. 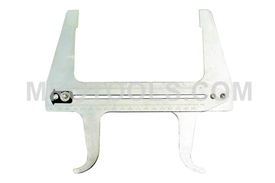 380A Kastar Brake Resetting Gauge description summary: Kastar Brake Resetting Gauge. Wide working range allows measurements from 6-1/2 to 13-1/4 in diameter. Locks the measurement at the appropriate inch or metric calibration during use. Quantity discounts may be available for the 380A Kastar Brake Resetting Gauge. Please contact MRO Tools for details.